This is a really easy rice, lentil, and veggie dish to prepare. It is perfect for days when you want a quick, hot meal. 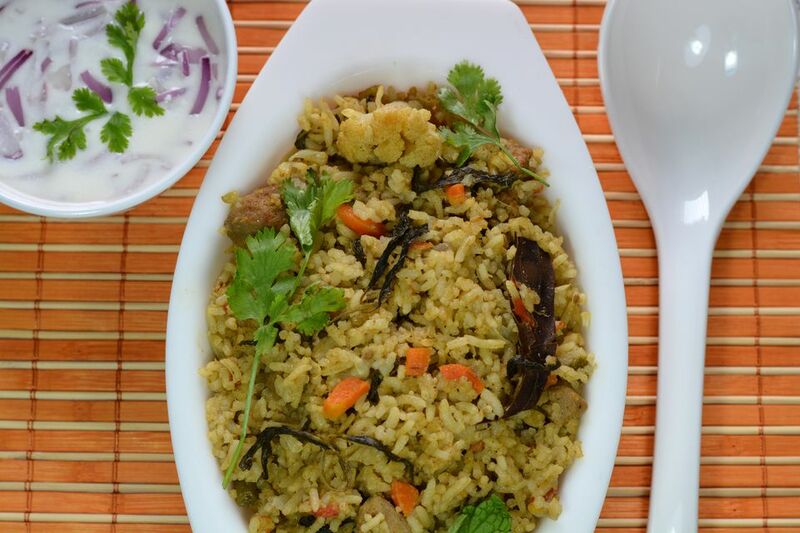 Veggie pulao smells so good while cooking, you'll be waiting for it to come off the stove so you can eat it! it is so quick and easy to make it is best made and eaten fresh. Serve it with your favorite raita, chutney and a green salad (if you feel up to it). Mix the rice and the masoor/toor in a bowl. Add water to the mixture and wash. Pour out water. Add more water and wash again and again till water is clear. Drain off all water and keep the mixture aside. Heat the cooking oil in a deep pan on medium heat. Add the onions and fry till soft. Now add all the spice powders and mix well. Cook/brown the masala (onion-ginger-garlic-spice mix) till the oil begins to separate from it. You may need to sprinkle a little water over the masala as it cooks, to keep it from burning. Stir frequently while browning masala. When the masala is cooked, add the tomato to it and cook till pulpy. Add the rice and daal mixture, the mixed veggies to the masala, add salt to taste and pour in the warm water. Stir well. Cook till the water comes to a boil. Stir and monitor the cooking till most of the water dries up, and the rice begins to develop 'pits' on its surface. Turn the heat down to low, simmer and cover the pan. Cook till done. You will know the rice is done when you press a grain between your thumb and index finger and it squishes completely. Turn the heat off now as some cooking will continue to take place even after you do that. Let the dish rest on the stove (turned off) for 5 minutes. Uncover and garnish the pulao with the chopped fresh coriander. Serve piping hot with the delicious mom's tomato chutney or a raita of your choice.